- Thoroughly cleanses the skin while keeping moisture intact. Gold Glaze Facial Improves the blood circulation. Hence it helps hydration and maintain the skin's level. This is one of the best facials considered by women due to its property of having 24 carat gold in it. The 24 carat gold present in the gold facial gets penetrated in the skin easily which further facilitates removal of toxins and regeneration of cells. Even the mask, which is used in the end contains gold, helps to restore the youthful qualities of the skin. 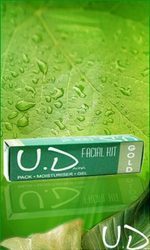 It has five beautiful and effective Ayurvedic pack of gold facial cleaner, gold scrub, gold cream, gold pack, skin whitening gold serum makes your skin radiant. It polishes the skin surface & gives you the ultimate look, you get praised by so many secret admirers. This facial gives you a long lasting metallic look with gold dust and enhances deep skin conditioning and softness, adding shine and luster of your facial skin.